Eurasia is a landmass that embraces a space between the western end of “Europe” and the eastern end of “Asia”. Albeit simplistic, taking this definition of Eurasia promises an exploratory, open-ended journey into one of the most complex way of thinking through the region, which questions existing borders and distinctions in all dimensions such as the geographical, cultural, political, and social ones – and in turn calls for new connections and pathways across cosmic, geologic and spiritual dimensions. Unmapping Eurasia is a long-term trans-cultural project initiated by Casco Art Institute: Working for the Commons that takes an itinerant approach. It will evolve as it travels, in ‘movements’, where encounters, studies, discoveries, and speculation over other kinds of movements, institutions, infrastructures, resources, and cultures will take place in collective forms. Each movement will generate pathways that lead to and materialize as artworks, maps and/or texts. Unmapping Eurasia is envisioned to be a warm, welcoming gesture that opens up one of the largest fields for commoning practice and invites institutional and non-institutional partners on board to be co-initiators, researchers, and cartographers in the collective project of (un)mapping Eurasia. In Seoul Eurasian Steps will unfold as a day-long itinerant exhibition that invites the public to join a literal and allegorical journey by walking and studying together, and imagining different Eurasian pathways in intersecting historical, geographical, political, economic, cosmic and spiritual dimensions. 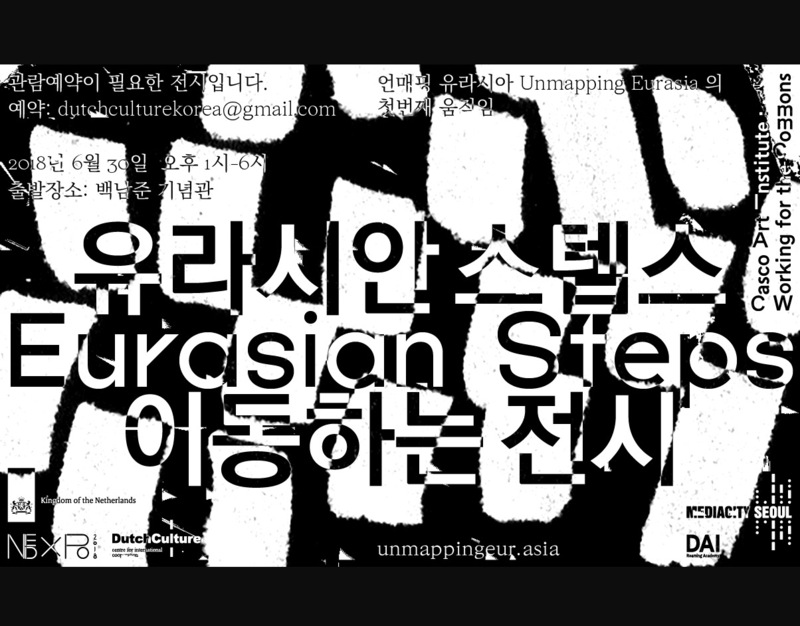 Not a static exhibition or symposium, Eurasian Steps is a collective journey of walking, talking, and mutual learning in the old city center of Seoul. Here, wonjok (원족) is utilized as a basic, overarching method by the artists and researchers to present various positions and techniques around (un-)making Eurasia. Wonjok means “a picnic” or “a long distance walk” in the old use of the Korean language but verbatim it translates to “walking a distance by foot.” Korean artist Nam June Paik (1932–2006) often recalled wonkok during his school days in Seoul – a recollection that echoes his well-known artistic experiment with global networks as well as his attempts to form a Eurasian collective along with Joseph Beuys. Against this background, Eurasian Steps’ wonjok will begin by gathering at the Nam June Paik Memorial House where the orientation for wonjok will be given. From there we will leave the museum and walk towards the west. The exhibition will make several stopovers en route, including at palaces, a temple, a market a museum, a commercial complex, and a park. Each stopover will host a presentation by artists and researchers that provides conceptual and aesthetic tools for (un)mapping Eurasia. Along the way, other interventions and conversations will take place. Eurasian Steps is organised with the support of the Dutch Embassy in Korea and Dutch Cultures Foundation for their NEDxPO 2018 program and as part of Mediacity Seoul Biennale 2018 by the Seoul Museum of Art.